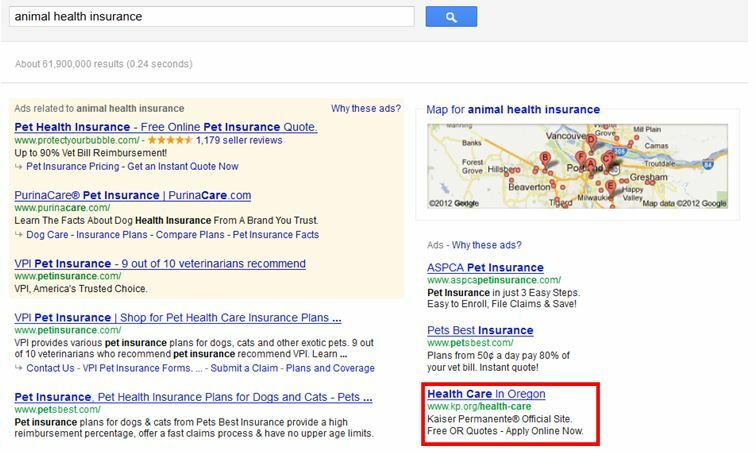 For example, healthcare insurance advertisers targeting generic terms like “health insurance” should add negative keywords like “pet”, “animal”, “dog” and “cat”, to ensure their ads don’t show for search queries like “pet health insurance” or “dog health insurance”. The below example illustrates how Kaiser Permanente should consider adding “animal” as a negative keyword to their campaign. Building a good negative keyword list is imperative to the success of any PPC campaign, whether it is a new campaign or an ongoing campaign. New Campaigns – Any new campaign should have an expansive negative keyword list to ensure media spend it not wasted on irrelevant traffic. A good place to start is to make a list of services/product your organization does not offer. Competitor names are often good examples of negative keywords to add to the list. Next, utilize Google’s Keyword Tool to identify unrelated terms and add those as negative keywords to your campaigns. There are several paid and free tools that generate common negative keywords lists, for advertisers including WordStream, QueryMiner, PPC Hero’s General Negative Keyword List and KoMarketing B2B PPC Negative Keyword List. Google’s Search Suggest is also a great place to identify potential negative keywords based on high volume search terms (see below image). Existing Campaigns – The Search Query report is an advertiser’s best friend for existing campaigns. This report identifies the search queries searchers used that triggered an ad, which resulted in a click. The Google Search Query report can be found by navigating to the Keyword Tab > See Search Terms > All. From the Google interface advertisers can directly add irrelevant terms as negative keywords. The Search Query report in adCenter can be found by navigating to the Reports Tab > Create new report > Search query performance. The adCenter report can be exported to excel and negative keywords can be added manually to the campaigns or done through adCenter’s Desktop tool. Depending on the volume a campaign receives, Search Query Reports should be performed on a weekly basis to ensure advertisers are only spending their budgets on relevant terms and traffic to their site. It is fascinating to investigate the keywords searchers use to ultimately click on an ad. Some of the search queries are quite humorous; however spending thousands of dollars on untargeted traffic is not. Like other keywords lists, negative keywords are not something advertiser’s set up and then simply forget. Ongoing negative keyword research and management should be happening on a weekly basis at the very least. Advertisers need to be aware of the ongoing trends in their industry and current events that could generate impressions for target keywords, for negative keywords anything that isn’t relevant should be added as a negative. Negative keyword expansion can be entertaining and save a lot of money for advertisers, so get started today!